Updating your garage door with paint makes your home look sharp and increases curb appeal! If you are fortunate enough to have a house AND a garage, you know how unsightly an old garage door can look. If you’re like most people, your garage gets used multiple times a day so it’s no surprise how quickly it can start to look dingy. Don’t fret! With a few coats, your discolored garage door can look brand new. First things first, the paint! You want to be sure you are using a exterior paint when painting the garage door. Using exterior paint will ensure that there is no flaking, peeling, or cracking of the paint during the changing of the seasons. You will also want to be sure that you prep your door to assure long lasting results. If you’ve painted before, you know that thorough prep work is paramount. Also be sure the weather will cooperate with enough time to dry. If it begins to rain or is too cold, you can expect debris to lodge its way into your paint job or paint that doesn’t adhere well. Not only does this completely update your garage door but it gives your home a modern look! 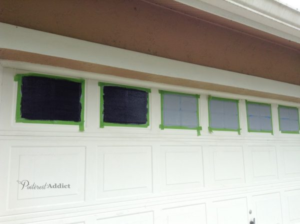 If you are concerned about people seeing into your garage with the use of real windows, you will love this idea! All that is needed for this job is masking tape and a black paint. See the Remodelaholic’s tutorial here. Painting faux windows can take your home from lackluster to highly sought after. 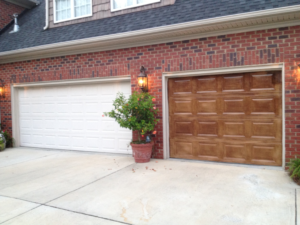 Following the “faux” trend – Do you have an aluminum garage door that you wish was wood? Use a gel stain and stipple the stain on to give it the effect of a wood door! This is a great way to camouflage a door that was browned due to use! 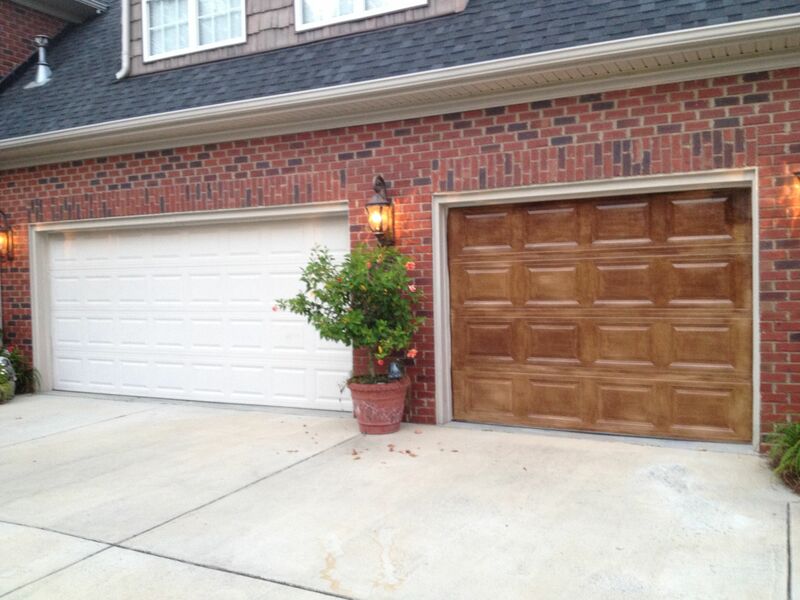 Wood garage doors can be updated with a stain or an exterior wood paint. You will want to be sure to scrape off any flaking wood, sand down the door, apply a primer and then proceed with painting. This will almost guarantee that your paint job looks professional. For these types of doors, you will want to use an exterior latex paint. Painting these types of doors can be tricky. When painting, you will want to be sure your environment is dry and not too hot or cold. This will allow for the paint to properly adhere to the door and prevent any future flaking or cracking. This is a quick and usually inexpensive way to give your garage that much-needed boost. For previous hardware, you will want to strip off old paint, prime, and then choose your new paint color. If you want to add new hardware, there are many options. Most home-improvement stores will carry a “decorative garage door accent” which will include all the materials you might need. If not, you can pick out your desired accents and attach them accordingly to your door material. Here are step by step instructions on attaching accents. 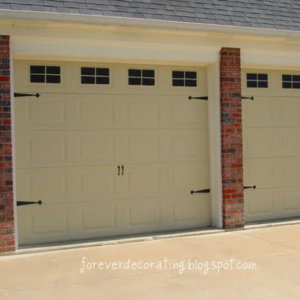 If you are looking for more details on how to paint a garage door, check out Behr’s tutorial. Whether you decided to paint your own garage door or hire a professional painter to get it done, we can agree that a newly-painted garage door makes a heck of a difference in your home’s appearance! With your updated door, you will get a little extra enjoyment pulling into your garage every day! If you live near or around Breckenridge, please give us a call at 970 418-5368 cell or 970-547-9778 office. PreviousInterior Painting: It’s All in the Prep Work!